The Mayor of Derry City and Strabane District, Alderman Hilary McClintock, is hosting a free Family Fun Day at the Foyle Arena on 12 August in an effort to raise awareness and vital funds for her two chosen charities – Action Cancer and Tearfund. Speaking ahead of the event, the Mayor said the family fun day was a great way of getting families from across the Council area out and about and involved in fun activities while raising awareness of two great causes. “As Mayor I am delighted to be in a position to host a free Family Fun Day where parents and their children from across the Council area can come along to the Foyle Arena on 12 August from 12 to 4pm and take part in a wide range of fun activities. There will be everything from arts and crafts to bouncy castles and an obstacle course, as well as a kids’ carousel and a phone booth, free climbing wall sessions and face painting. “I hope that as many people as possible will come along and take part in what promises to be a fun filled day of free entertainment. During the day we will have representatives on site from my chosen charities – Action Cancer and Tearfund – who will promote the fantastic work that they do. I will be encouraging families to support the charities by making a small donation and pledging their support for the charities on the day,” she added. In addition to the family fun day, the Foyle Arena is one of a number of Council leisure facilities currently offering a range of summer activities for kids – including swims, squash, badminton, netball, etc, all for just £1 during the months of July and August. Gillian Thompson from Action Cancer said: "Action Cancer is delighted to be working alongside the Mayor of Derry City and Strabane. This Family Fun Day will be a great day for the local community whilst helping raise awareness and support people in your local area affected by cancer. Photo Captions: The Mayor of Derry City and Strabane District Council, Alderman Hilary McClintock pictured with her grandchildren Charlie (10), Ben (8) and Caitlin (6) and Rev. 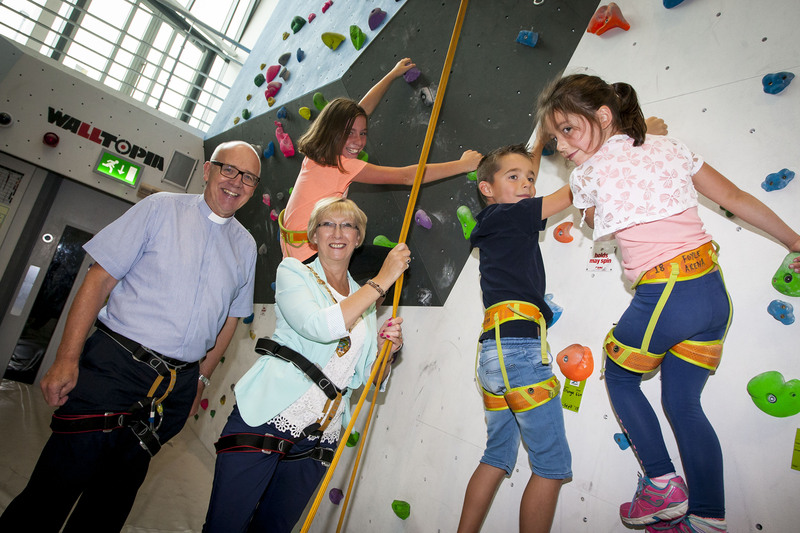 Rob Craig (Tear Fund), one of her main charities this year, at the Climbing Wall in Foyle Arena on Tuesday afternoon for the launch of her Annual Fun Day which will be held on Friday, 12th August at the Arena from 12 noon until 4pm.